We finally did it! Â The boy is potty trained!!!!!! After months of fighting, pleading, bribing, arguing, and disappointment, I finally found the right combination of things for Ethan to want to potty train. Potty training! Ugh! We are not there. Christian is so emotional and holds it cuz it is too traumatic to go. He would rather go to bed at 6:00 then go potty. (And his bedtime is closer to 10). He is not an eater and doesn’t like chocolate and all that wonderful stuff. He is a mystery in this area. When it happens, it will be God!! WOOOHOOOO!!! So happy for you!!! Congrats! I do know how hard it is to potty train a boy! My son, now at 4 years old, FINALLY uses the potty! He wanted to try around 1 1/2 – 2, but lost the motivation. Waited a little while and tried again and again. He was trying until after his brother was born and then he didn’t seem to want to. People were saying that he just might not be ready yet. After not trying anymore, so as to not push him, we started up again. Now he doesn’t even expect a treat! Christian still has time to figure it out. He may not want to do it right now, but, rest assured, he won’t walk across the stage at his high school graduation in diapers! 🙂 Just keep offering it to him and eventually, he’ll get it and realize it’s actually better to use the potty than a diaper. 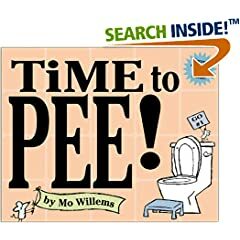 We got this book for my Bean when we were gearing up for potty training. She’s been trained since the first of the year, but she still loves to read this book. It’s a good one. I loved that book, too! So many things to look at in the pictures and the text was so cleverly written, too. Definitely a must-read for that age group! !